Content. Whenever you read an article or SEO how-to guide about what is required for great Google rankings, it is the one thing that pops up over and over again. The now cliché, ‘content is king’, is widely over used. But for good reason. It is king. Yes, links, citations, well optimized content, and many other factors can be wildly important, but without content you have nothing, and a Blog can be a great way to introduce that content. Why is content so important? For three core reasons. First, think of your patients. When a patient is researching a dentist many will check out your website. When you have solid well written content this helps show the potential client that you know your stuff. Next is for links. Other websites will not likely link to a sparse website with minimal useful information. By creating useful and relevant information you provide other webmasters with valuable, linkable material. Great content can generate links all on its own and those links help to further drive the third reason. Rankings. Google and other search engines look for relevant authoritative content on websites to help support their meaning and relevance. By having ample content that supports your sites understanding of your industry this helps give Google confidence in your site. And those links you can generate as a result, Google likes those too. A lot. For some industries the ideas behind the content are endless. For dentists they may be slightly more limited, but not without a vast number of possibilities. Here is just a small sampling of potential dental specific ideas! News on new dental procedures and industry breakthroughs. Detailed information how various dental procedures are handled. Unbiased guides on consumer products. Which toothpaste to use? Which mouthwash is best? What types of toothbrushes are recommended? What to expect during your first visit to a new dentist. Everything you ever needed to know about wisdom teeth. Common dental problems and how to prevent them. History of dentistry. Create an interesting comparative post about dentistry in the past with today. I could keep going on and on! While your content should be created primarily for your potential users, you do want to keep Google in the back of your mind at all times. Here are a few suggestions to help you get the most out of your blog post. 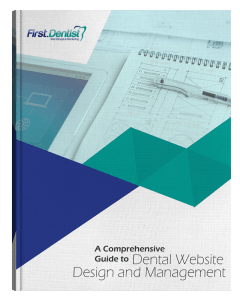 When you create your blog posts or other fresh dental related content you want to first and foremost ensure that the articles read fluidly and make total sense for your patients. Search engines do like to see relevant keywords within your content so be sure to inject relevant words and synonyms where possible, but don’t overdo it. If it makes complete sense to place a keyword in a sentence, do it, but don’t force it. There is no specific rule as to densities or percentages, but if I had to share a figure I would say less than 7-8% for any specific target word is probably best. Within your content be sure to link to other relevant pages on your site from time to time. Again, there is no hard-fast rule as to how many links to include, but having a few that make sense can be beneficial. For instance, if you have a post that discusses porcelain veneers, consider linking the words ‘porcelain veneers’ to a services page on your site that discusses cosmetic dentistry. If you are writing about the history of dentistry and part of your article talks about old fashioned ways they removed wisdom teeth, consider linking ‘wisdom teeth’ to another blog post you wrote that is all about wisdom teeth. Much like keyword insertion you do not want to force this, but link to relevant internal pages where a natural opportunity occurs. Write your content in a way that your target audience can relate to it. For example, this very blog post is about Content and SEO, but since you are most likely a dentist or dental professional I have written it with industry specific examples and put that dental spin on it. This not only helps drive home the message, it is good for SEO as well! Your content will most likely be directed at patients and potential patients. So remember this. Create your content in a way that they will understand it. You will likely want to leave out technical jargon you would use when speaking to another dentist. Use common or more simplistic terminology when possible. For instance if you are talking about a ‘malocclusion’, just say misalignment. Many would not know what a ‘malocclusion’ is. Sixty seconds ago I didn’t. Google loves quality content. Webmasters love linking to quality content. Users love reading quality content. They key here is quality. It is an overused word but it is an important one. Your content must be well written, well researched, and interesting – quality. If you can make it funny even better. If you create the content for your dental website with love, others will love it back, and your site will be successful.